Last night, we surprised you with something. We were invited to a Pampered Chef Party at Christina and Tom’s house. Christina thought it would be fun for you and JSL to come and play with TJ. I did not mention anything to you until after school. You were so excited and quite helpful when we went to the store. When we arrived, TJ was waiting at the door. He was so excited to see you. All of the boys went upstairs to make sure you were set to play. Eventually, we called the two dads down to participate in the cooking presentation (made sense since they are the cooks). I joked that at times it sounded like a herd of elephants were upstairs instead of three little boys. Then it got quiet. That always makes me nervous. For some reason, parents just know something is going on when there is no noise. The noise level resumed and then again it was quiet. Shortly after this, you came to the stairs and called to Tom that TJ was really a mess. We told you to go back to playing. We probably should have listened. It seems that your guilt had gotten to you, and you were nervous about the mess that did exist. A short time later, TJ came downstairs and he was covered in something. We had no clue what it was at first. 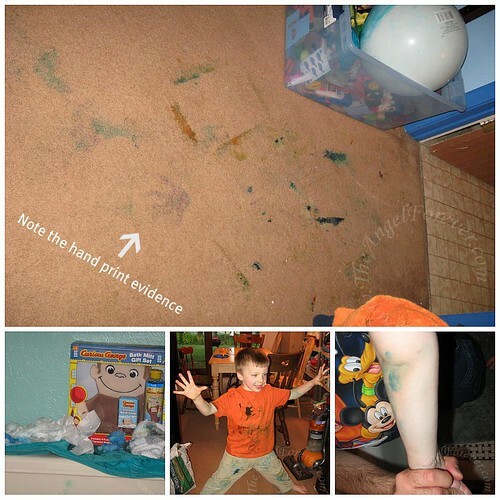 Soon we learned that there had been unopened, still packaged finger paint in TJ’s room. From the bits and pieces we figured out you wanted to open it and got TJ to agree it would be fun. Not knowing how to open the top of the container you looked around for a tool. When Tom was cleaning, he figured out what you had done. Our little MacGyver had used a Hot Wheels like airplane to poke a hole. Yes, you saw that the plane had a sharp tip, popped it through the plastic barrier and voila! Thank goodness it was not a very large hole, that stopped the paint from coming out too quickly. When I went upstairs, I was expecting paint to be all over everything. No, you and TJ had not done that. Apparently, you at least wanted to paint on paper-like items and did not go to the walls or doors. The carpet was just the drop zone that was an unintended victim. We talked with you about making good choices and to think about things. You know we don’t paint in bedrooms and should have brought the paint to the adults. As upset as we were, it was interesting to see that you and TJ also tried to clean things up. Tom had heard the water running. It was the two of you trying to clean up the evidence seen here. Meanwhile, JSL must have just been the casual observer since he hardly had anything. Needless to say, you and TJ each had scrubbing sessions last night. We found more paint under the sleeves of your shirt and your shorts when we arrived at home. Lesson learned by the adults: When 3 children are too quiet, finger paint may have been located, opened by airplane and used all over! Thank goodness the damage was not too bad thanks to washable paint. With any luck, Christina and Tom will invite us over again (sorry guys) in the future. .-= RobMonroe´s last blog ..Grace Fight! =-.